Once you have validated your business idea and want to pursue it you need to create some content around it. If you are really serious about starting your business, you have your idea, you have some people that bought it, now you have to go out and tell more people about it. These 3 reasons are superb for starting a blog. Just do it, seriously. But how often do you publish? And how do you know what to write about? I’ve created a content strategy just for you. Before you start writing you have to be very clear about who you are writing for. You have to create a buyer persona for your customer. If you take eClincher, for example, all of our content is geared towards three different types of people – social media managers, small business owners, and large agencies. If your writing is relevant to those people then we are more likely to attract them and convert them to our customers. If your writing is not relevant to the people that would be interested in your product then you are wasting your time. You want the right people to see it right? For a great read on how to build buyer personas around keywords click here. Once you zero in on the specific audience that you are writing for you have to go out and find what would be interesting to them. what skills are they looking to acquire? what is something that they are likely trying to troubleshoot? What would bring the most value to their business? Then go out and research the solutions. One really neat tool I use for that is Zest which is a Chrome extension that shows you the top marketing articles on any topic. Since I like to write about marketing and anything that is related to online business this tool does just fine for me. It publishes the top 1% of marketing articles on various topics. Now that you have the content all figured out go out there and share it with the world. Consistency – whatever medium you post in make sure to post consistently. You can use a tool like eClincher to schedule your posts throughout the week. Go hard on video – video is becoming the most popular medium, even LinkedIn launched their own native video feature. If you are not comfortable with it yet, try making 2-3 minute clips for each blog post and see how that works. Respect each social media channel – each social media channel is its own community with its own guidelines and rules. Make sure to change the format and the look of what you post on every single page and profile. Tell your story – if you want to grow a following organically you need to be your authentic self. Telling your story is one of the best strategies to do just that. Instagram Stories is going to be a HUGE hit in 2018 so go check that out. Build a community – the way to build an organic community of engaged followers is by dropping your two cents in a positive and authentic way on top posts every day. Gary Vaynerchuk has a great video on this for Instagram. Your content might be firing on all cylinders but there comes a time in every entrepreneur’s life that you need to take a good look at yourself and re-structure. I wanted to drop my two cents on this real quick. I had a lot of moments when I was writing content nonstop and nothing was happening. I had to take a look at my buyer personas and make sure that the content is aligned with them. I had to look at my keywords, and the medium, and the distribution channels and re-examine those. It’s super important to remember why you are doing your business, who you are selling to, and what problem you are solving. Running a business doesn’t mean that you need to be a workaholic. It just means that you have to have a few key processes in place. Short Meetings – make meetings shorter, get everything you need to get across and move on. No Ego – teach everyone around you to leave their egos by the door and bring the positivity and good attitude. Cy Wakeman wrote a great book about this, read it here. Don’t forget Health and Family – have a balance in your life and spend time with your friends and family. Also, take care of your body. Work out, eat better, do fun outdoor activities. The people that work 120 hours a week quickly burn out. Don’t do it. 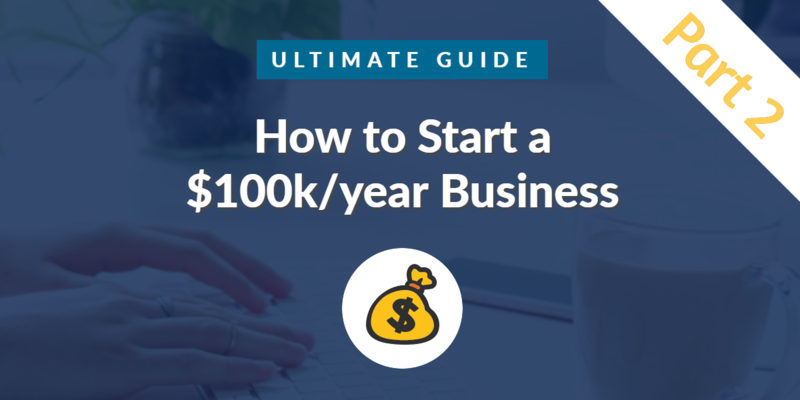 That’s it for Part 2 of the How to Start a $100k/Year Business. Leave me a comment and tell me what you think. Questions, concerns, and emotional outbursts are all welcome.